Tickets range from $49 (Sunday showing) to $59 (Saturday showing) and includes a glass of wine or sangria. Take a walk on the spooky side when the Europa Village Players present “Polter Heist,” an audience participation murder mystery. 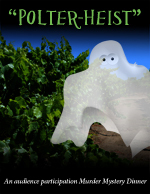 The action takes place at the Europa Village Winery, where the Boogeyman Outreach Organization (BOO), a support group for ghosts, is holding its annual convention. As BOO members, you’ll observe a seance, meet the Winery’s ghoul-in-residence, and learn dark secrets about every cast member. Someone will be ruthlessly murdered at the end of the show and it’s up to you to solve the crime! Performance will take place during a gourmet dinner prepared by Europa’s own award-winning Chef Dean Thomas, and be accompanied with a glass of his famous Sangria, or Europa Village Wine. This entry was posted on July 29, 2013 by Ashley Ludwig in 2013, Entertainment, Europa Village, I heard it through the GrapeVine, Wine Country and tagged Audience, Audience participation events, Crime fiction, Europa, Europa village winery, events in wine country, How to host a murder, John Goldsmith, Sangria, Saturday, Sunday, Temecula, Theatre, Vineyards, what's going on in wine country, Wine.